I tried really hard to eat at RoliRoti at the Thursday Farmers Market, but my stomach and my limited lunch hour wouldn’t allow me to wait in that horrendous line. 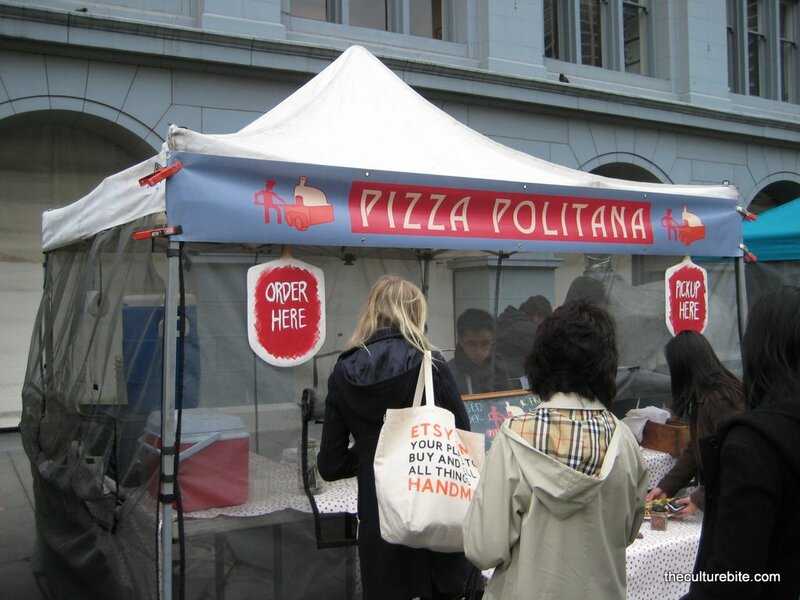 I opted for the shortest line at the ferry market, Pizza Politana. Often it’s a clue when the line is that short, but I was in a rush and pizza was sounding pretty good at that point. All the pizzas are made-to-order at Pizza Politana. Although my intention was to get something quick, I still ended up waiting 30 min for the pizza. I found it pretty cool how they cook their pizzas in a dome-shaped oven outside next to their tent. When waiting for the pizza, I watched the 3 employees stretch out the dough, assemble the toppings and pop them in the oven. Each pizza takes about 2-3 minutes to cook, and I assume you can only cook 3-4 pizzas at a time, hence the long wait. There are only a few options at Pizza Politana. They’ve got the classic pizza margherita, a plain mozzarella pizza, and a special of the day which was a spinach and creme fraiche pizza. I would’ve totally ordered the special if it wasn’t $12. The pizzas are individual size, so you’d still be hungry if you shared. Pizza Margherita ($8) w/egg (+$2) – I chose this one because it’s a good basic pizza for measuring the quality amongst other pies at other pizzerias. The crust is super thin and crispy, sauce was light, basil was fresh, and to top it off, it had just the right amount of fresh mozzarella sprinkled on top. Before taking the pie out of the oven, the chef broke an egg on top of the pizza and cooked it in the oven. When it was time to eat, I pierced my fork through the over medium egg so the yolk oozed onto my pizza. Yum! I only have 2 complaints. One being the way they cut the pizza with the egg. They divided it into uneven squares and cut the crust off of the piece with the egg, so I really had no way of holding it. Two is how they wiped the bottom of each pizza with a nasty black towell. I understand the towell is meant to wipe off the burnt flour off of the pizzas, but it’s just unsightly to witness that before you eat.